Willkommen auf der offiziellen Website von Udo Kier. 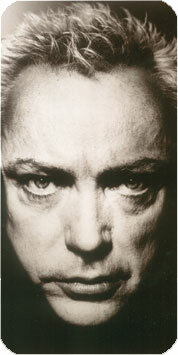 Welcome to the official website of Udo Kier. Unter films findet Ihr die komplette Filmografie. Im Bereich media gibt es die Möglichkeit aktuelle und ältere Interviews zu lesen. Eine grosse Auswahl an Film- und Magazinfotos findet man unter photos. Das Gästebuch erreicht Ihr durch einen Klick auf guests. films shows you the complete filmography of Udo Kier. In The media section you get the possibility to read the latest and older interviews. A large variety of filmstills and magazine photos can be found under photos. Visit the guestbook by clicking guests. Hier könnt Ihr Euch den Willkommens-Clip ansehen. Watch the welcome clip here.